The Lake Havasu Area Chamber Ambassadors held a ribbon cutting ceremony for Prestige Assisted Living to celebrate 20 years in Lake Havasu City. 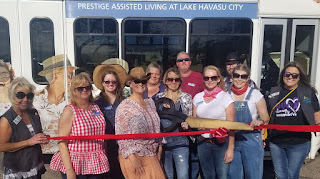 Prestige has two communities in Lake Havasu and offers Assisted Living and Memory care. Its innovative wellness program is designed to achieve optimum level of health throughout all aspects of life. Prestige’s award-winning Memory Care Program provides an outlet for creativity through arts, learning, and spirituality. Its active communities enjoy casino trips, happy hour, wellness classes with a personal trainer and much more! Attending the ceremony from left to right were Kathy Baumer, Lorely Burgduff, Stefanie Thompson, Laura Romo, Betty Emmons, Stephanie Rohn, Patrick Houdeshell, Victoria Furman, Jacob Brookshier, Sarah White and Sarah Stinnett.